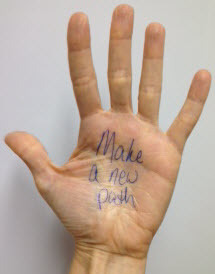 High Five – Make a New Path! I admit it, I have a background in English and I have a weakness for verse. But when I re-read this passage from Robert Frost, I thought it fell right into the positive category. Why? Because making and owning a decision gives us control and that control allows us confidence to go forth and make more decisions, even to divert from our current career path. As I’ve stated before, having control can lead to a more positive life. This could mean you change jobs for better pay, hours, more work-life balance, a chance to expand your skillset or you change careers to develop your skills in a different area. Maybe you remain at the same company and grow in your current job – team lead, supervisor, manager or encourage those in power to help you create a new position. If job changes are a constant, why tread down the same old path? No sighing involved, make a decision to take the less traveled road and make all the difference for yourself.